Evidence for the conditions marijuana can treat for can be found here. Of particular interest in recent times has been Cannabidiol (CBD), which is now stocked in dispensaries and medical centers throughout the United States thanks to its medical benefits and the lack of “high” associated with Tetrahydrocannabinol (THC). However, there are medical uses for THC, too. So, why is marijuana medicine? Well, without going too into the scientific details, the main two cannabinoids mentioned above (THC and CBD) have specific medical benefits for most of the above conditions. THC increases appetite, reduces nausea, and controls inflammation, epileptic seizures and muscle spasms associated with neurological conditions. CBD has anti-anxiety properties, and also can control inflammation, epileptic seizures and muscle spasms. Thanks to its antipsychotic properties, CBD may also be used for schizophrenia treatment. So, what makes medical marijuana different from recreational marijuana? The common conception is that strains high in THC is for recreational use, whereas strains that are higher in CBD are for medical use. However, as there are a wide variety of conditions all needing relief from different ailments, this is far too simplistic a separation. This means that some conditions require cannabis that has both high levels of THC and CBD (e.g. night-time use for chronic pain, sleeping disorders), while others require cannabis purely for the CBD (e.g. seizures, asthma). Cannabis that has high THC but lower levels of CBD is usually better for daytime use and chronic conditions that can last throughout the day (e.g. chemotherapy side-effects, chronic pain), but where the patient wants to remain awake and motivated. 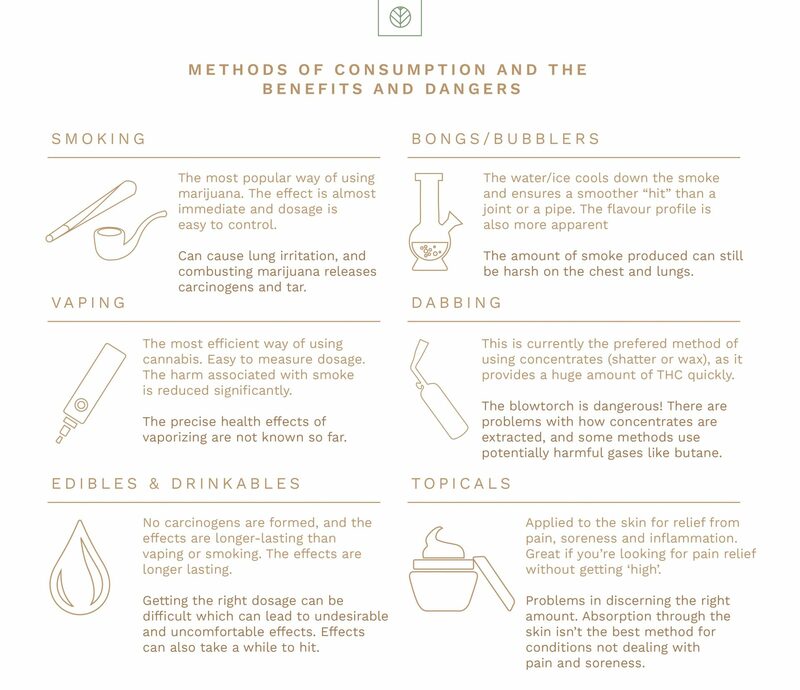 Now you know a little more about MMJ and it’s uses below is a helpful infographic showing the various methods of consumption. If you have any questions or are looking to get a medical marijuana card then please get in touch.